Try taking in these numbers: 344,000 flights, 57 million passengers, 2 million tons of cargo. That’s just some of the statistics the Dubai International Airport handles in a year. Then consider the 60,000 people that work there to keep it running, safe, secure and on schedule, including at Terminal 3, which happens to be the largest building on earth by floor space. And that number doesn’t even include the team working on the new $3.2 billion (Dh11.7 million) A380 facility. Add to that the action at Air Traffic Control which handles emergency landings, or the drama of customs intercepting suspected smugglers or engineers taking apart multi-million dollar jets to dealing with late flights and angry passengers. All of this makes for a compelling subject, which is exactly what National Geographic Channel has done with Ultimate Airport Dubai, a 10-part series that premiers on Thursday night at 8pm. tabloid! spoke with the series’ director, John Smithson, and asked him how he and his team documented the story of the world’s second busiest airport for international passengers, and why it’s such a good one to tell. When did you start filming Ultimate Airport Dubai? We started discussions with the Airport in January 2012 and started filming in September 2012. TV audiences around the world are fascinated by what is happening in Dubai. Plus the incredible growth of Dubai Airport is amazing. They are changing the global face of aviation and making Dubai the crossroads of the world. So we knew it was a fantastic story. What kind of access did you get? We got great access, more than any other airport or airline has ever granted. Plus you need 24/7 assistance. You can’t just turn up and film. There are big safety and security issues and you can’t do anything that affects the smooth running of the airport. 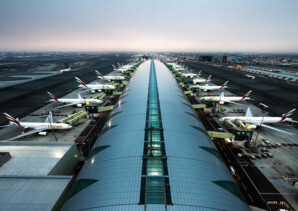 What struck you most about Dubai International Airport? What are the things that surprised you most? Just how busy it is in the middle of the night, when flights from all over the world connect up in Dubai. Most European and American airports are closed during the night, whereas Dubai is pulsating. What would you say were the biggest challenges? Filming a 10-hour series is a major undertaking and it is very difficult to plan what happens or be in the right place at the right time. How long were you filming? And how long did production take? We filmed from September 2012 to February 2013. From beginning to end it took nearly a year. What do you think viewers will be most surprised by? All the hard work that keeps the airport and the airline ticking over that, as passengers, we don’t see. What would you like viewers to take away from the series? We take flying for granted and expect to whizz around the world without thinking about the incredible skill and dedication of the people that make it happen. The 10-part Ultimate Airport Dubai will air every Thursday on National Geographic Channel at 8pm with a repeat at 11.30pm.